New orders have been placed for three cruise ships in the past fortnight, one for Norwegian Cruise Line, with an option for a second, of a new “Breakaway Plus” class from Meyer Werft in Germany; plus two new ships, in new classes for each of Holland America Line and Carnival Cruise Lines, from Fincantieri in Italy. Elsewhere, after the arrest of four of Classic International Cruises’ fleet of five ships in Europe, that line’s Australian affiliate, working with UK-based Cruise & Maritime Voyages, has succeeded in obtaining the slightly smaller German-based cruise ship Delphin to replace the Athena in the Australian market this winter. Finally, after P&O and Cunard slashed commissions payable to UK travel agents to 5% at the beginning of this year, Royal Caribbean and Celebrity, and now Norwegian Cruise Line, have followed Fred Olsen Cruise Lines, who in March cut their basic rate to 10%. This is all in an attempt to stop travel agents from offering rebates to “buy” cruise bookings. This month has brought news of three new cruise ship orders for beleaguered European shipyards, one order coming from Norwegian Cruise Line and one each from Holland America Line and Carnival Cruise Lines. The first announcement came two weeks ago from Norwegian Cruise Line, when it stated that it had reached agreement with Meyer Werft in Germany to build a new ship for delivery in October 2015, with an option for a second to be delivered in the spring of 2017. The new ship, at 163,000 gross tons and 4,200 passenger berths, will be larger than the 146,600-ton 4,000-berth “Breakaway” class ships now being built by Meyer Werft but will incorporate many of these ships’ new design elements. The new “Breakaway Plus” ship will be the largest in the Norwegian fleet. The new ship, along with the option for a second, will be the tenth and eleventh that the Company will have built at Meyer Werft. Meanwhile, on Friday, Carnival Corporation & plc announced that it had reached agreement with Italian shipbuilder Fincantieri to build two new ships – a 2,660-berth 99,000-ton ship for Holland America Line, for delivery in the autumn of 2015, and a 135,000-ton 4,000-berth ship for Carnival Cruise Lines, for delivery in early 2016. A memorandum of agreement has been signed for the construction of the two ships, the total cost for which, including US dollar-denominated contract price and all owner’s costs, will be about $1.3 billion, or about $195,000 per lower berth. This memorandum is subject to customary closing conditions, including execution of shipbuilding contracts and financing. 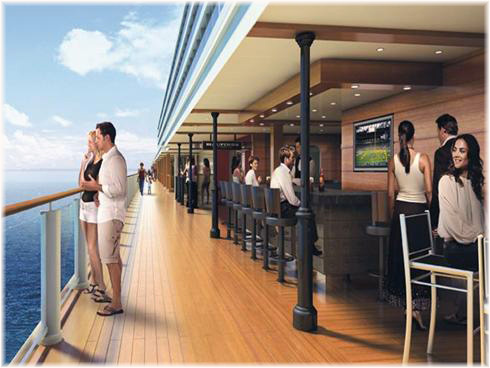 The Holland America ship will be a new class of vessel for the line, and will enter service five years after the last Holland America delivery, the Nieuw Amsterdam of 2010. 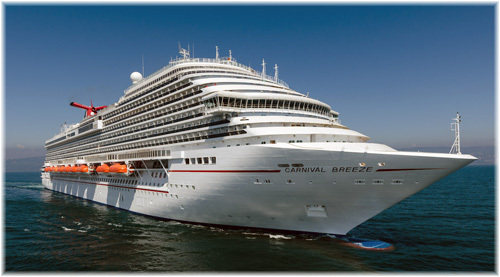 The Carnival Cruise Lines vessel, also of a new class, will be launched four years after the Carnival Breeze, which debuted this spring. This timing is similar to the five-year span between upcoming new ship introductions for both Princess Cruises and P&O Cruises. “Today’s order continues the company’s strategy of introducing two to three ships per year across the corporation’s ten brands. We have strategically timed the introduction of these new ships to allow ample time for those brands to further grow their passenger base and absorb the new capacity,” said Micky Arison, chairman and ceo of Carnival Corporation & plc. Carnival Corporation & plc now has nine new ships scheduled for delivery – two each in 2013 and 2014, three in 2015 and two in 2016. The addition of new tonnage is expected to some extent to replace existing capacity reductions from possible sales of older ships. The oldest classes of ship currently operated by these two brands are the eight Carnival Fantasy class and Holland America’s Statendam class and Prinsendam. Word has come to us from a passenger who booked for the Athena’s November 12 voyage from Marseilles to Fremantle, that the Australian “arm” of Classic International Cruises has chartered the 16.214-ton Delphin to replace the 16,144-ton Athena, which is still under arrest in Marseilles. The Delphin, with a three-star score of 1,126 out of 2,000 in the 2013 Berlitz “Complete Guide to Cruising & Cruise Ships,” slightly exceeds the two-star-plus Athena, with 1,092 points out of 2,000. During the summer months the Delphin is operated by Passat Kreuzfahrten of Hamburg and Offenbach, and she will now replace the Athena on seven cruises from Fremantle and four from Adelaide during the Australian summer season, plus a further three cruises. The extra cruises will be required as CIC have about 6,000 passengers booked, while the Delphin has about 10% less capacity, with thirty fewer cabins than the 640-berth Athena. In addition, the German ship does not have a casino, although the lack of Athena’s eight slot machines and a card table should not be a major problem. 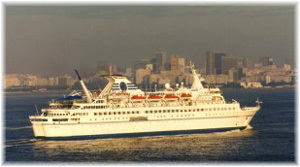 The Delphin has actually cruised in Australian waters before, as the Belorussiya for CTC Cruises, a company that closed in Sydney in May 1996. She changed ownership again last year after the former Delphin Kreutzfahrten went into receivership two years ago, and is now owned by Indian owners Visual Cruises Put Ltd, based in Mauritius. UK travel agents have earned for themselves a reputation as being among the least professional in the world by “buying” cruise bookings, something they do by rebating from their commissions to sell on price. Now, two more cruise lines have this month joined Fred Olsen Cruise Lines in cutting base commission levels from 15% to 10%, with effect from January 2013. Two weeks ago, Royal Caribbean and Celebrity, and last week, Norwegian Cruise Line, announced that they would be cutting UK commission levels from 15% to 10%, in a move that follows similar action taken by Fred Olsen Cruise Lines in March. P&O, Princess and Cunard had started this move, upsetting UK travel agents by slashing commission levels to 5% in January. This action in turn left the field clear for other lines to cut commissions to 10%, a level that still meant they’d be paying agents twice as much as P&O and Cunard, and must be a decision that P&O, Princess and Cunard have come to regret. The latter lines have actually just cut to the standard industry rate of 10% instead of the 5% over-reaction first invoked by P&O, Princess and Cunard. Just as a side note, it is interesting that Azamara Club Cruises is not included in the latest Royal Caribbean and Celebrity move and it makes one wonder why Cunard allowed itself to get caught up in P&O’s unseemly cut to 5% commission last January, a level that most travel agents say they cannot make a living on. Most cruise lines still offer incentives such as marketing funds, co-operative advertising or bonus payments, and this is particularly true for travel agents who do not devalue the market by giving away a large part of their commission. The cruise lines regard rebating (somewhat puzzlingly referred to as “discounting” in the UK) as a formula that is highly likely to result in the failure of agents who give away too much. In a reaction to the latest cruise line moves, two UK travel consortia, Advantage and Travel Network Group, representing 1,500 UK agents booking £350 million of cruise business, have joined forces to oppose cruise commission cuts. This they are doing by urging their own members to steer bookings to cruise lines that pay the highest rates of commission.